Analysts believe that plans by the US and EU to block access to high-tech equipment for companies from Russia will affect offshore projects of Rosneft and Gazprom. The U.S. and its European allies are discussing at the highest levels the possibility of banning the supply of modern technologies and equipment to the Russian oil and gas sector, according to a report by the Financial Times. The move may entail the United States imposing additional licensing requirements for the export of equipment. The sanctions have been prepared by the West in response to fears that Moscow will attempt to disrupt the upcoming presidential elections in Ukraine. If these fears become justified, the sanctions may be activated. The Bazhenov Formationis the largest shale oil field in Russia. Reserves here are estimated at 1.24 trillion barrels. 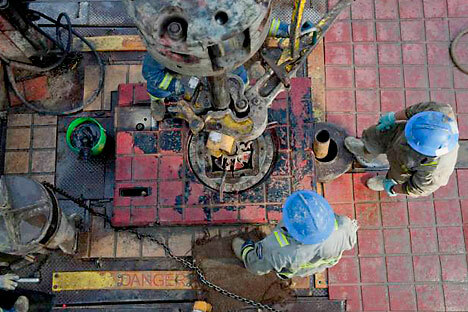 By 2020, production could reach 15–18 million barrels annually. However, the oil here is hard to extract. (Data from the U.S. Energy Information Administration). The Kara Shelf is considered a promising gas-bearing territory directly adjacent to the Yamal Peninsula. Fifteen percent of the region’s oil and condensate deposits has been explored, and about 2 percent of its gas fields. D1 and D2 category liquid hydrocarbon resources in the region reach 300 million tons, while natural gas resources in the same categories are assessed at 29.8 trillion cubic meters. Projects already in operation will not fall under the new sanctions, with the ban likely to affect new programs, such as the development of the complex fields of the Bazhenov formation in Western Siberia or deposits on the Kara Sea shelf. A Kommersant source close to Rosneft noted that such sanctions could become a serious obstacle to the implementation of many projects, especially the ones on the shelf. “These types of resources, both the reserves of the Bazhenov formation and the Arctic shelf, do require significant scientific and technological development and high-tech equipment. The share of Western equipment in such projects is at a maximum, as Russia is just beginning to work on such projects,” Alexander Kornilov, an analyst for oil and gas at Alfa Bank, told Gazeta.ru. However, in this case, Western sanctions will have an impact not only on Russian companies. The reason for this is that the majority of Russian companies are working on difficult oil projects in collaboration with foreign investors. Rosneft cooperates on offshore development with the American company ExxonMobil, Norway’s Statoil and Italy’s Eni. Moreover, the company is discussing the possibility of involving Asian partners in offshore projects, including the Chinese firm CNPC. Gazprom’s partner on the Sakhalin shelf is the Anglo-Dutch company Shell, while Gazprom Neft cooperates with the same company on two joint ventures in the Bazhenov formation and Lukoil plans, in the near future, to become a partner of the French company Total. Among the oilfield service companies working in the Russian market are U.S. behemoths such as Schlumberger, Halliburton and Baker Hughes. Schlumberger’s annual revenues on the Russian market is about $3 billion, while Weatherford earns about $1 billion and Halliburton and Baker Hughes make $0.5 billion each. Russian experts believe that the ban on the import of equipment is an issue of long-term oil production in Russia, since many projects the company plans to implement will begin only in 2020. That is why the introduction of new sanctions will not have an immediate negative impact on the market. “By the time the conventional oil reserves are exhausted, and foreign equipment not made available, Russia will have time to reach the proper level of production of its own high-tech equipment,” Aghvan Mikaelyan, managing partner of consulting group FinExpertiza, told RIR. This view was reiterated in a conversation between RIR and Igor Melnikov, president of the non-profit association Soyuzneftegazservis, who believes that the development of his company’s own software and hardware for the oil and gas sector will take 2–3 years, during which time the company will be able to use already acquired technologies. Moreover, in his opinion, Russia can continue to cooperate with foreign companies through intermediaries, regardless of any potential sanctions. If sanctions are imposed, domestic companies will have to dramatically increase their research and development investments over the next 20–25 years. According to estimates by Grigory Birg at the analytical department of Investkafe, the necessary investments are estimated at billions of dollars. In the meantime, the amounts being spent are much more modest: Gazprom allocates about 0.16 percent of its annual sales for this purpose, while PetroChina’s innovation budget is 0.7 percent of total revenues, and Petrobras devotes 1 percent to research projects. In monetary terms, spending in 2011 was estimated at $2 billion for the Chinese company, almost $1.5 billion for the Brazilian firm, while Gazprom spent just $227 million (8 billion rubles) and Rosneft $261 million (9.2 billion rubles).